After a hot start in Eredivsie, Ajax’s blues after the turn of the new year continued, this time in the form of an emphatic victory for Feyenoord thanks to their sharp transition play and effective defensive matchplan. Erik ten Hag’s Ajax entered the match in second place in the Eredivisie, two points behind PSV at the beginning of the matchday. Set up in the club standard 4-3-3, their selection was largely predictable. The absence of Nicholas Tagliafico due to injury prompted the selection of Lisandro Magallan, shifting captain Daley Blind toward left back. Feyenoord also utilized their customary 4-3-3, with Robin van Persie being granted the start over Jorgensen by Giovanni van Bronckhorst. From the onset in this high stakes match, both sides aimed to press high to stifle the opponent from being able to build out effectively. While both sides had common traits, each of them had some distinct features to their pressure that were fitting given the strategical focuses of opponent. Starting with the visitors, Ajax first had Kasper Dolberg slightly left of centre, aiming to attract Feyenoord to the left side for build up. Ziyech would be positioned between the left back and van Beek, ready to step up and form a duo with the Danish striker, forcing him inside with his cover shadow. 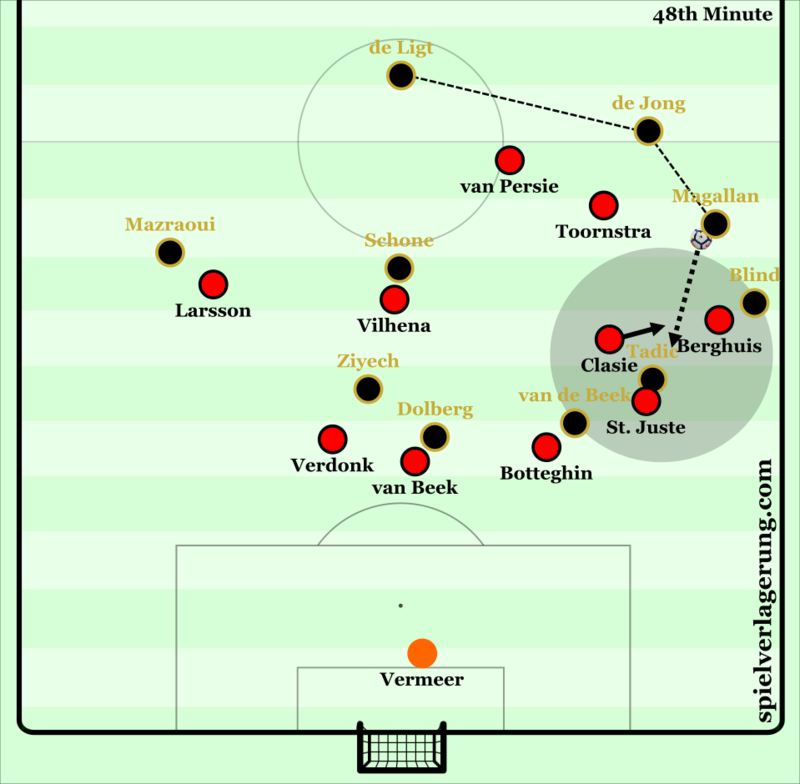 On the other side, Tadic drifted inside slightly, maintaining access to the far side wing in case of a switch of play, as Donny van de Beek maintained rather tight man-orientations on Clasie to limit their metronome from getting a large share of possession. Pressure did not extend to the goalkeeper, prompting Vermeer to be the playmaker in order to defeat Ajax’s pressure if he received the ball. Due to Ajax’s central focus in their pressing and Feyenoord’s reluctance to use Vermeer, Ajax had some strong chances early in the match upon these central ball recoveries. Further up the field, Ajax was mixed in their coverage, with some strong man-orientations depending on if the ball was within close proximity, or the relative distance of Feyenoord’s players. For instance, Blind was hesitant at some moments to step up onto Berghuis if he had check exceptionally deep, at the risk of exposing his defensive line. Instead, the midfield would shift to pressure this option, with Dolberg dropping deeper to occupy the locations that van de Beek primarily was during the match. Ziyech and Dolberg formed a partnership up front to press Feyenoord’s centre backs, reluctant to use Vermeer. Combined with man orientations in midfield, Feyenoord were unable to break through and nearly concede a second goal in quick succession. To escape these situations, van Persie’s play as a target man was vital, dropping 5-10 meters from de Ligt receive aimed balls, laying off onto Toornstra who was the closest options for these situations. Vilhena alternated between dropping as additional support for Clasie as Feyenoord built out, or moving as a second striker for chance creation as the ball progress toward the final third. Since Vilhena was often in the deepest lines of play as Vermeer struck long flighted passes, Toornstra was the primary recipient of these layoffs. Feyenoord’s high pressure was sparingly applied, but had a stronger man-oriented footprint when Onana was on the ball for goal kicks, with a similar onus being placed on the Cameroon goalkeeper as a distributor. van Persie did not aim to split the centre backs like Dolberg did, instead stepping toward the goalkeeper and subsequently blocking the path to de Ligt through his movements when they were made. 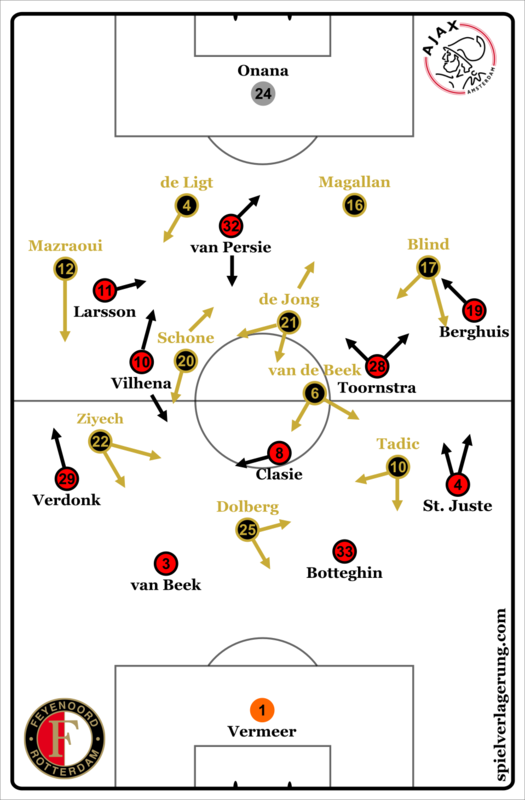 The more common mechanism that Feyenoord defended with was a mixed coverage 4-1-4-1-0 midfield block set up just around half way, with van Persie occupying the top of the centre circle. Their wingers pinched into their respective halfspaces, making a narrow distance across the line of four. Whilst man-orientations were tight, they were also close enough that a player nearby could easily step to provide coverage in case one player had to step to a nearby dribbler. The congestion centrally for the first parts had an interesting effect on Ajax’s ball progression, as it prevented Frenkie de Jong from making his trademark dribbles into midfield to move possession forward. Instead, de Jong was often forced to stop the ball and wait for the central defenders behind him to support him to recycle possession or play the ball wide to force Feyenoord’s lines to shift toward the wing. Once forward options were prevented, Feyenoord would step up onto passes back toward Magallan, forcing the Argentine to rush his next action and potentially cause an error. 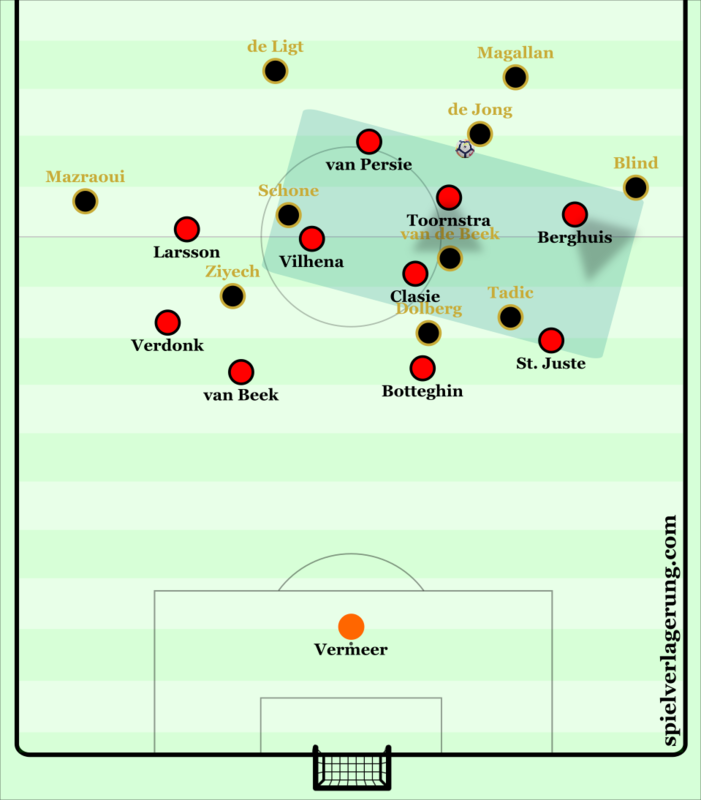 Whilst it allowed Ajax a bulk of possession at first, de Jong’s influence was tempered since the available space commonly found against Dutch man-orientations was nowhere to be found for his marauding midfield runs. Consequently, he began to drop deeper as the fullbacks for Ajax pushed up to push more players into midfield to increase occupation. Feyenoord’s midfield block greatly restricted the space for Frenkie de Jong to dribble into, forcing him to find other solutions to break down the oppponent. Instead, Ajax had the most success through overloading the left wing and halfspace. With Blind effectively functioning as the deepest playmaker of a diamond, Tadic and van de Beek interchanged as they hoped to dismark their opponents, with Dolberg drifting into the halfspace to either play lay-offs into Tadic or turn for himself and dribble at the Feyenoord defense. These cyclical shifts had some success, yet often the orientation of players receiving in wide areas made them easy to press, as they were commonly facing the touchline and tightly marked. Diagonal passes from Blind into the left halfspace were the origin of many of Ajax’s best looks, but Feyenoord adjusted their block intelligently to anticipate these passes, increasing the defensive intensity onto passes targeted for Dolberg, pressing as he received the ball. While the first foul on him led to Schone’s free kick goal, the remainder of the match placed him under difficult constraints spatially with Clasie looking to backpress him. Since each team had fitting adaptations to negate their opponent’s key attacking tactics, transitional moments were the main moments in which each side posed the biggest threat. Counterpressing in this match was predominantly individual, with the number of nearby solutions higher due to the close proximity of teammates within the defensive shape, making it so both teams were able to play out of these situations with ease. Both teams’ ball recoveries were mostly central, although Feyenoord’s recoveries were often deeper than Ajax’s due to their defensive block. When Ajax took back possession, Feyenoord’s width in their attack permitted Ajax to be able to play through their structural gaps quite quickly, which formed in the halfspaces and wings. This penetration occurred either through the dribble or vertical balls forward, Ziyech often being quite high as Tadic was tasked with more defending in deeper areas. Restricted at first, de Jong was able to create several dribbling progressions in these instances, with the home side responding through compacting their block centrally, restricting the space for de Jong to progress. However, de Jong and Ziyech were able to work in tandem with the players around them, combining and using their resistance to pressure to lure defenders toward them, making defensive actions around the penalty area chaotic. Ziyech scored Ajax’s second goal through these means, but Vermeer made several good saves to prevent conceding more goals. When receiving the ball closer to their goal or even from goal kicks, Feyenoord hoped to quickly circulate the ball from one side to the other, capitalizing on Ajax being unable to shift at the same speed of the ball to progress down the wings as Ajax chase them. Afterward, Feyenoord hoped to dribble unless they were impeded by coverage. Regardless of recovery location, wingers would starting their runs instantly, able to run past Ajax fullbacks because of their high positioning. As Feyenoord ran at Ajax, this shifted the remaining defensive players players wider since the fullbacks were unable to keep up with Larsson and Berghuis. In turn, this also disrupted man orientations and stretched out the back players, leaving large gaps in between players for Feyenoord players to move into untracked. Mixed with Ajax’s heavily ball focused efforts in these counter attack situations, Feyenoord could easily move in one or more Ajax’s players blindsides to move into dangerous positions, being untracked before scoring. These happened on five goals they conceded, in which a blend of adventurism and eagerness proved costly. Ajax’s defenders commonly had poor orientation could have been fixed, such as an easy shift in body shape which allows them to see the player and the ball, which would correspondingly lead to better detection of their opponents positioning, perhaps preventing some goals in the process. In this transition, Ajax are fixated on the ball, not accounting for Toornstra and St. Juste’s movements centrally directly in front of goal. Berghuis is able to cross into them as Feyenoord equalize. Feyenoord were ahead 3-2 at the half, thanks to these trends. Since both teams were predicating a large portion of their attacks from transitions, the matched opened up to a surprising degree as time went on. With the change in game state allowing Feyenoord more security to take risks, the guests had to find a way to get themselves back into the match. From a team design point of view, Ajax were not equipped to be able to effectively play against Feyenoord’s block down a goal. The leftward focus in attack was not working due to spatial restrictions provided by the dimensions of the pitch in addition to Feyenoord’s occupation and tight marking. While implementing Blind into the attack is a wise move, he has a greater influence from central areas. The absence of Tagliafico created a large domino effect in causing attacking burdens for Ajax. Commonly in Ajax’s play, Blind, de Jong, and de Ligt will form situational back threes that come from the future Barcelona-midfielder dropping back into the defensive line. Rather than create an unnecessary superiority however, oftentimes one of the centre backs will move up into midfield as the ball is moving. These movements can be overlaps at times, becoming quite tiresome to continually track if the forward has been tasked to man-mark Blind for example. Yet these passes between the three of them oftentimes break central lines, and since all three members of that block are potent passers, defensive blocks cannot overload one side at the risk of being caught by a switch of play. The absence of Blind from this line made Ajax quite predictable, especially given Feyenoord’s defensive block prevented de Jong from dribbling. Magallan played simple passes toward Blind and de Jong, which were anticipated in the form of solid spatial coverage ahead of the ball. The intense leftward focus at times left Schone and Ziyech uninvolved in earlier phases of play, who were each relatively high up the pitch during early construction as Mazraoui looked to pin back Larsson. Magallan spends a long period on the ball here, allowing Feyenoord’s midfield to shift and block the pass into Tadic. With Blind in this situation, he would be able to complete this pass quicker or play more difficult passes such as Ziyech. From goal kicks, Onana preferred to pass to de Ligt instead of Magallan due to his superior press resistance and composure. Yet Feyenoord were able to anticipate these passes better in the second half given the change in the game state from the first half. They decided to implement their high press more, as they could do so with lower relative risk because of their lead. Prompted by the lead, Ajax were placed under more pressure in the match from Feyenoord in the first phases of their possession, not being optimally designed to cope with this altered approach. ten Hag’s first substitutions brought on Sinkgraven for Magallan to push Blind into the middle, although 4-2 down at the time. This helped Ajax, allowing them to generate more chances as Feyenoord’s defensive intensity began to waver. Yet impatience and rash positioning from the fullbacks made the home side’s counter attacks more and more potent, eventually piling on two more goals to complete a memorable victory. While derby matches are typically hotly contested, Ajax will be quite disappointed to have conceded six goals. For their youthful side, this will be a learning exercise in game management and how to play when losing, a problem that Ajax has rarely had to face this season. This margin could absolutely. play a big role late in the season as goal difference comes up for league standings. Over the last two matches, Ajax have conceded ten goals, a cause for concern given how they had only conceded eight goals over the first half of the whole season. Nicolas Tagliafico is perhaps a bigger loss than initially anticipated. How Erik ten Hag adjusts the team in his possible absence will be interesting considering they face Real Madrid in two weeks in the Champions League Round of 16. Feyenoord appear to be comfortably in third place, yet still too far to insert themselves into the title race at this point in time.